Most runners know the importance of eating well before and after runs. Fueling during endurance exercise, however, is the sport's newest unchartered territory. Promises of improved performance and advanced recovery have coaches and athletes alike paying attention to what we put into our bodies on the go. For the everyday runner, it's just as important and necessary to know how to use on-the-run products to keep your body going without causing GI distress. Here, we break down the how, why and what to use to fuel during your harder, longer miles. Let's make one thing clear: You don't need to fuel during every single run. Rather, mid-run fueling should be saved for efforts longer in duration (and of greater intensity). Your liver already stores approximately 90 to 110 grams of glycogen, and depending on a range of both genetic and training based factors, your body is capable of storing roughly 1,800 to 2,200 calories, which is more than enough for an easy to moderate run of 6 to 9 miles. Consider that a typical easy run of 6 miles at approximately 10 minutes per mile would burn--for the average runner--between 400 and 450 calories and you'll get a good feel for actual caloric needs within training. 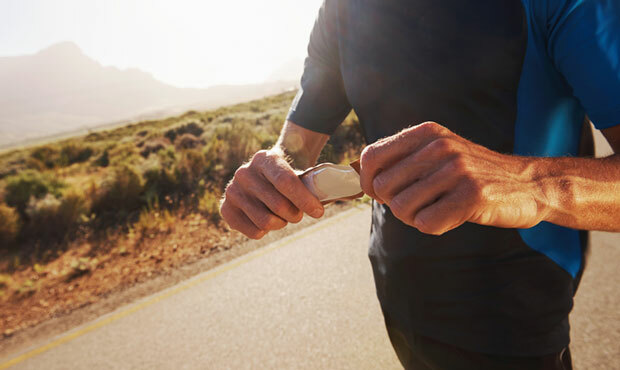 Even with preparation for longer events, such as the half marathon or marathon, there is virtually no physiological "need" for mid-effort caloric intake for shorter runs. In fact, many coaches--this author included--recommend runs devoid of fuel to teach the body how to utilize fat stores as efficiently as possible.
. A well-trained individual has roughly enough stored glycogen to get through the first 13 to 19 miles of a 20-mile effort. By occasionally depriving yourself of fuel during select sessions, you'll teach your body to be more efficient with its utilization. So where should you draw the line in terms of fueling as it relates to physiological need, as opposed to improved recovery? And what products are available that will target your needs?